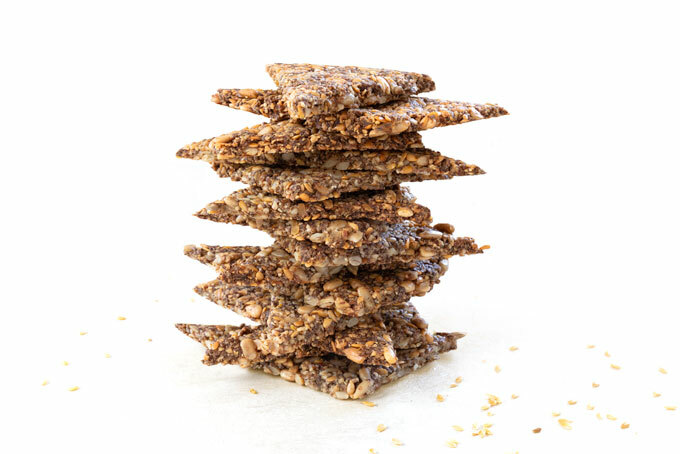 These nut and seed crackers are nutty, light, crispy, and customizable. They are really easy to make and pretty hard to mess up. You can eat them plain, but I like to serve them with sprouted hummus, guacamole, or as as side to a creamy soup. While some foods seem easy to make, others may appear trickier at first glance. For example, baking a loaf of bread is pretty common, but you don’t find many people coming up with their own crackers! There seems to be a misconception that making homemade crackers isn’t easy, since it’s not as obvious how to make them compared to baking something like bread. 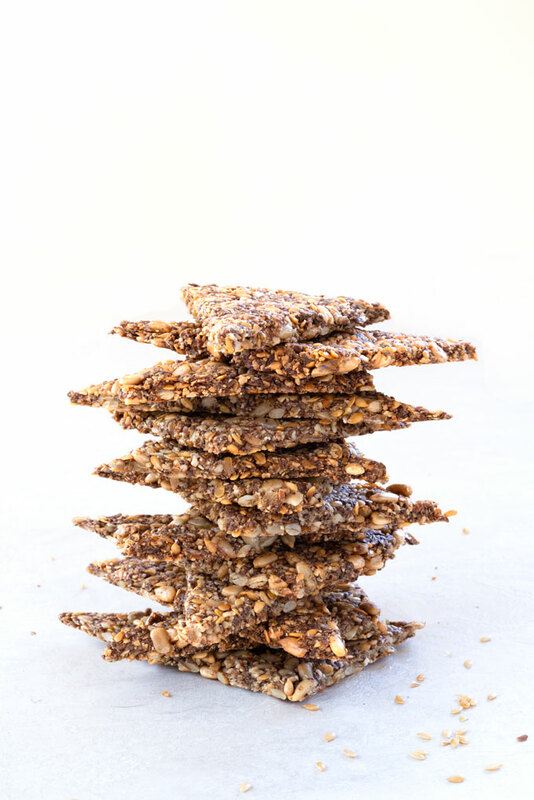 To be honest, I didn’t start making my own crackers until a few years ago when my friend shared a recipe with me for raw (or baked) multi-seeded crackers. Ever since then, I have been hooked. I actually find that making crackers is easier and faster than making breads. Both my husband and my 4-year old daughter actually prefer these nut and seed crackers to the actual nut and seed bread. Perhaps it’s the crispy, crunchy texture, the slightly toasted flavor, or the mere convenience of a quick snack…I’m not sure but I am with them on this. If you’re not sold on making crackers out of a bread recipe, there are other (easy) ways to make crackers. For instance, you can cut tortilla wraps into chips. I do this with my 1-ingredient flaxseed tortillas and almond tortillas (recipe coming soon!) at least once a week. Recently, I also found out that you can also make excellent crackers out of this lentil pizza crust. So, now I make crackers not only from nuts and seeds, but also from legumes. The ingredients are exactly the same as the ingredients for this nut and seed bread. That’s right. 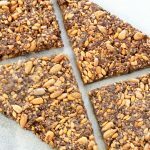 The same recipe with a new method to make nut and seed crackers that happen to be not only vegan, but also paleo and keto friendly. The only difference between making a loaf of bread and crackers is that instead of shaping a loaf (or using a loaf pan), you need to roll out the dough into a thin sheet. Fortunately, the dough is really easy to work with. All you need are two pieces of parchment paper (not wax paper!) and a rolling pin. The parchment paper is really important because you’ll need it not only for rolling out the dough, but also for baking the crackers. If you happen to have any holes in the rolled out dough, just grab a little bit of the dough and patch it. I usually use a rolling pin and just roll the new piece over the hole. It’s that easy. Score the dough before baking. This will help with breaking the crackers into the shapes you like. I usually make the nut and seed crackers quite large, but you can make them as large (or as small) as you like. When I make them myself, I just score them into triangles or rectangles. When I make the crackers with my daughter (who LOVES using cookie cutters), we end up with all kinds of shapes. There is no right or wrong. Slide the parchment paper (with the scored cracker) onto a baking sheet and bake it for 20 minutes. After 20 minutes, remove the baking sheet from the oven, and flip the entire cracker over. Peel off the parchment paper, and bake the cracker for 10 more minutes for an evenly brown color. The easiest way to flip the cracker is to slide the parchment paper from the baking sheet onto a big cutting board. Then cover the cutting board with the baking sheet and flip the cutting board over. When your crackers are done, let them cool completely, then break the crackers along their scored lines. 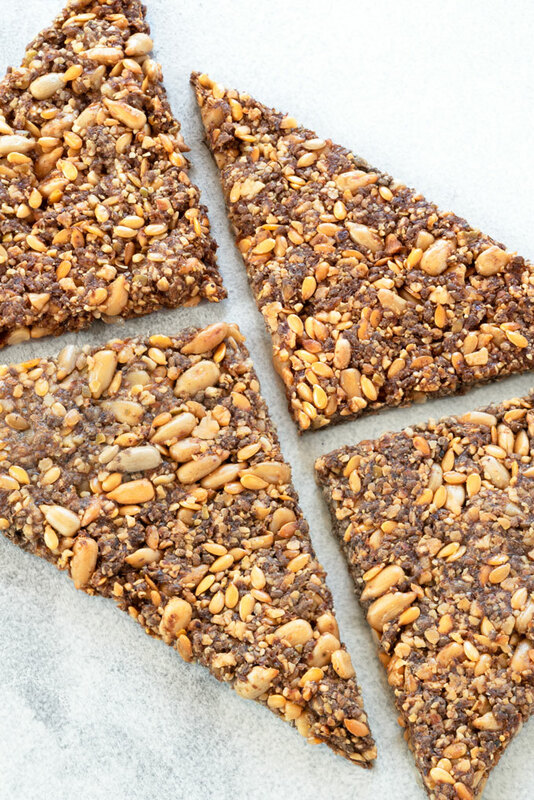 These nut and seed crackers are nutty, light, crispy, and customizable. They are really easy to make and pretty hard to mess up. Combine the almond-hazelnut-pumpkin-seed "flour" with the rest of the ingredients. Stir until the dough is combined. Divide the dough in half (or thirds if you want really thin crackers). Place the dough in between two pieces of parchment paper. Using a rolling pin, firmly roll out the dough into a thin sheet. Remove top layer of baking paper and using the tip of a knife, score the dough into shapes you like (I chose large rectangles but it’s up to you). Repeat with remaining half of dough. Preheat oven to 350°F (175°C). Slide the parchment paper with the dough onto a baking sheet and bake for 20 minutes. Remove the cookie sheet from oven, flip the whole cracker over (if it breaks a bit, don’t worry!) and peel the parchment paper off of the back. The easiest way to flip the cracker is to slide the parchment paper from the baking sheet onto a big cutting board. Then cover the cutting board with the baking sheet and flip the cutting board over. Bake for another 10 minutes, until fully dry, crisp, and golden around the edges. Let cool completely, then break crackers along their scored lines and store in an airtight container for up to 3 weeks. For longer term storage, store the crackers in an airtight container in the refrigerator or in the freezer for up to 3 months. Yummy. I just threw in whatever nuts and seeds I had. How would I make sprouted seeds and nuts? 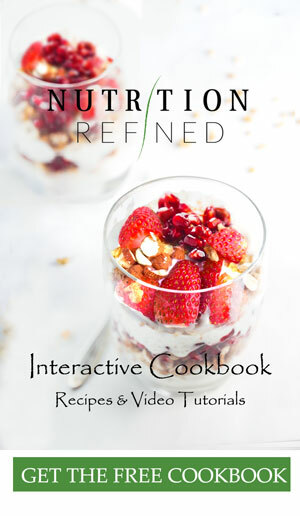 psyllium husk in this recipe? If there’s something that could work instead if it? I don’t have it but want so much to make that crackers! These are just the thing to help my stay on my keto journey. I desperately needed something crispy to snack on…a girl can only eat so many nuts. They were so very easy, I used the nuts and seeds I had on hand and the taste is so satisfying. Thanks for sharing. Will make many times again. Thank you so much for the feedback! ❤️ So happy to hear you enjoyed the crackers so much!